CM series-Chlorinated Polyethylene|CPE|Acrylic Processing Aid|AIP|Acrylic Impact Modifier|AIM|Impact Modifier|ADC blowing agent|Chlorinated Polyvinyl Chloride|CPVC|Polychloroprene Rubbe|Chloroprene Rubber|Neoprene |Chlorinated Rubber|Thermoplastic Polyurethane Resin|TPU)|High Chlorinated Polyethylene |HCPE|Chlorosulfonated Polyethylene|CSM-Acrylic Processing Aid, Chlorinated Polyethylene - Sundow Polymers Co.,Ltd. Chlorinated polyethylene is a heat, weathering and oil resistant elastomer that has used in many wire/cable, hose, automotive and industrial parts for many years. Its unique combination of heat and oil resistance makes it an ideal choice for many under the hood applications. It is also gaining increasing use in many industrial hoses, replacing some well-established materials such as CR due to concerns over high cost and availability. Since CM provides superior heat aging and excellent ozone resistance, it is increasingly used to replace some traditional materials to upgrade the end products performance. 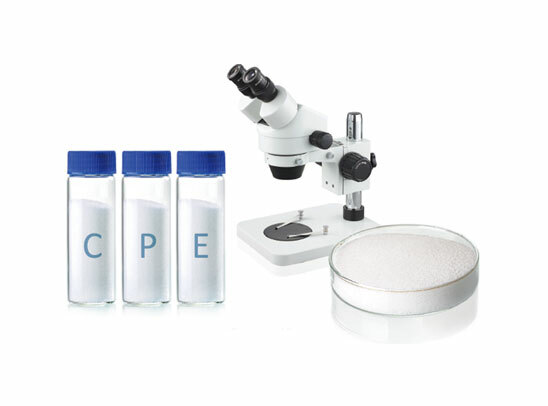 By using HPDE of different molecular weight and molecular weight distribution, adjusting the production process, many types of WELLPREN®CM elastomers can be produced by Sundow, these types are commercially available in the market in large scale, which have different chlorine contents and Mooney viscosities, applicable for different fields and different processing conditions. As special synthetic rubber, WELLPREN®CM has superior comprehensive performances and good performance-price ratio. Therefore, lots of customers choose WELLPREN®CM for substitution of CR and CSM. High viscosity grade for highly filled hose, cable jackets, HPN cords, sponge and molded products. Medium to high viscosity grade for improved extrusion and good mechanical properties at higher filler loadings. Medium molecular weight and Mooney viscosity, superior mechanical performances, good processibility, quick extrusion and good final product appearance. Medium viscosity grade, widely used for wire/cable, hose and molded products. Medium molecular weight and Mooney viscosity, high modulus, superior mechanical performances, good pricessibility, quick extrusion and good final product appearance. Specially designed for hose application. Medium to low molecular weight, Mooney viscosity between 60 and 70, superior mechanical performances, applied in many fields and with good processibility. Low viscosity grade for hose, sponge, wire and cable and molded products. Lowest molecular weight, lowest viscosity, best processbility, quick extrusion and excellent final productd appearance. 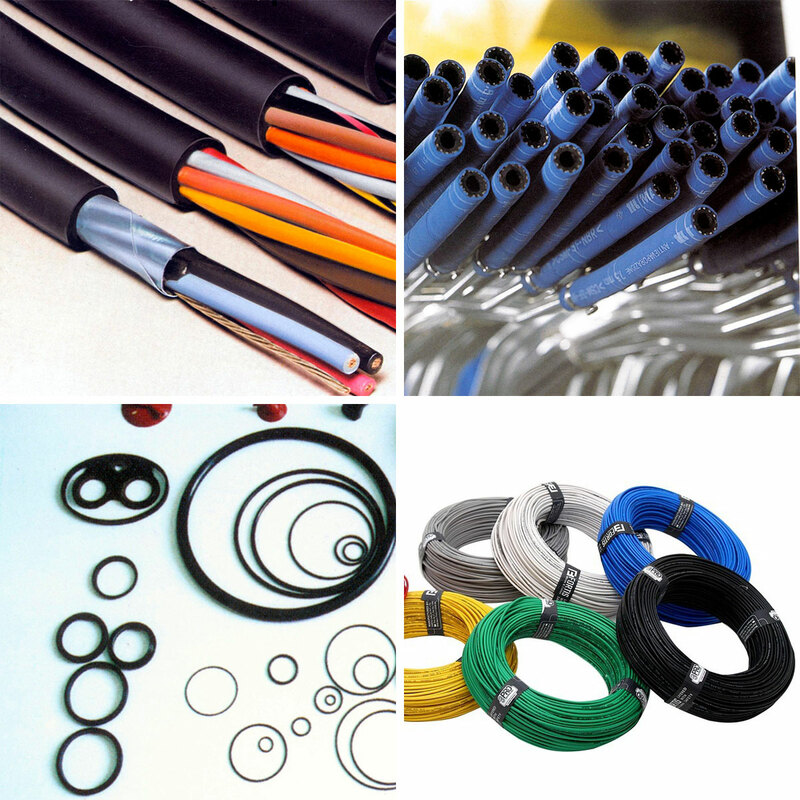 Wire/cable, hose and molded products. High chlorine content, moderate Mooney viscosity, superior mechanical property, excellent flame retardancy and oil resistance. Used for products with requirements for high mechanical performances, flame retardancy and oil resistance, such as flame retardant and oil resistant films, tapes, hoses, wire and cable. High molecular weight, superior mechanical performance, high modulus, low chlorine content, excellent low temperature property, excellent absorption ability to filler. Magnetic rubber, industrial and automobile hose, etc. Lower chlorine grade for improved heat resistance and better low temperature properties. Medium molecular weight, low chlorine content, high modulus and easy to process. Specially designed for magnetic rubber application, especially for oil and heat resistance magnetic rubber application. Lowest chlorine, medium viscosity, semi-crystallinity and good compatibility with PE and PP. Above is just part of our grades, if you want to know further information or more grades, please contact info@sundow.com. 1. Automobile Hoses and Industrial Hoses. 3. Various Types of Specialized Rubber Products. 4. Combined use of WELLPREN® CM with other rubbers like EPDM, NBR and BR. 5. Application in Magnetic Materials.